The nation's museums are playing a big role. 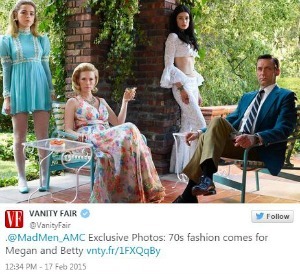 We want to watch more Mad Men, but that would mean the series finale is coming and I’m not sure we can handle that. We got a sneak peek at some of the characters in some released photos this week. And today, the late 60s/early 70s vibe was taken even further with the newest trailer, which goes heavy on the sideburns and crazy patterns. Also, let’s all marvel at Pete Campbell’s facial expression and hairline. The second portion of the final season will begin airing on April 5, so we have a month and a half of promotions ahead of us. And AMC is getting help from the nation’s museums, who are acknowledging the cultural influence of the show… all at the same time. Among the plans, the Museum of the Moving Image in New York City will have an exhibit focused on things like props, costumes and video clips starting on March 21. The Los Angeles County Museum of Art will screen some popular episodes around that time. And in Washington DC, the Smithsonian American History museum will showcase various memorabilia starting at the end of March. It should be noted that many of the exhibits highlighted by Flavorwire are taking place in the Big Apple, which makes sense since it’s where the show is set and it’s the global hub for advertising. But more significantly, it’s a big win for the network, which will see lots of chatter around the show as the premiere approaches. Not only will the museums be promoting their exhibits with the April debut as the news hook, but there will be exhibit reviews, think pieces, slideshows and other sorts of media coverage to kick things off. That in addition to all of the retrospectives about the show and what it has done and accomplished over the course of its seven years. We’ll have more of Don Draper and the gang than we can probably handle.